The first ever female private secretary to any British Prime Minister, Caroline Slocock had a front-row seat for the final eighteen months of Margaret Thatcher’s premiership. A left-wing feminist, Slocock was no natural ally – and yet she became fascinated by the woman behind the ‘Iron Lady’ façade and by how she dealt with a world dominated by men. As events led inexorably to Thatcher’s downfall, Slocock observed the vulnerabilities and contradictions of the woman considered by many to be the ultimate anti-feminist, and witnessed the astonishing way in which she was brought down by her closest political allies. In this vivid first-hand account, Slocock reflects on the challenges women still face in public life and concludes that it’s time to rewrite how we portray female leaders. A remarkable political and personal memoir, People Like Us charts the dying days of Thatcher’s No. 10 and reflects on women and power, then and now. An outstanding new biography... this remarkable, beautifully-written account of the decline and fall of Britain's first woman prime minister is a book about the deeply complex relationship between femininity and real, hard power: the clash between testosterone-driven male egos and a woman who had to manage them and simultaneously protect herself from them. It's a great read and I could not recommend it more highly. Much more than meets the eye in this book – really interesting on women and power in the present day as well as Thatcher and her time. Wasn't that fascinating! Caroline Slocock, really worth getting her book, People Like Us. If you were to say, post 1945, which particular day would you want to walk straight into at the heart of politics and watch what was going on...I think you'd go with 22nd November 1990, wouldn't you? - the day Margaret Thatcher resigned, and Caroline was there! This is a book of multiple fascinations. As an insider’s view of the final phase of Margaret Thatcher’s extraordinary premiership, it would succeed on its own, but Caroline Slocock’s account is much, much more than that. As the first woman to work as a civil service private secretary at No. 10, her observations illuminate the place of women at the top end of public service in the late 1980s and early 1990s. It is also deeply interesting on how to keep civil service impartiality in a No. 10 suffused with ideology. People Like Us is as rich in its human story as it is with the high politics. Historians will dip into People Like Us as if from a well. The most striking part of the book is the description of the day she resigned…which is very hard to read almost, it’s very emotional…very worth reading. This is more than just the story – quite familiar in powerful people – of a character who is much nicer in private than in public. It is part of a bigger narrative…. The book makes the reader think about wider questions. Why is it that the three most striking characters in British public life in the past 50 years – Margaret Thatcher, Diana, Princess of Wales and the Queen – have been women? Is it mere rarity value? Or is it because – though each is so different from the others – there is something about being female that touches reality more closely? 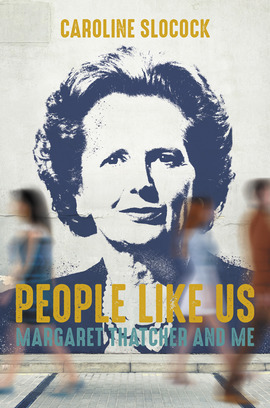 People Like Us is an important part of Thatcher studies. Anyone interested in Margaret Thatcher should get hold of this book. This is an excellent, highly readable memoir which really does shed new light on the “Iron Lady." Full of fascinating insight into the daily life of No 10. Poignant, hugely interesting [with] superb personal accounts. A unique, unwarty political portrait. For a fresh look at a much-mythologised woman, try People Like Us: Margaret Thatcher and Me by Caroline Slocock, Mrs Thatcher's private secretary for her last 18 months in office. Although she did not agree with her boss politically, Slocock came to admire her profoundly, and asks why this trailblazing woman in power was sentenced by feminists of her day to "a kind of sexual excommunication". It's hugely interesting on feminism and women in power and the impossible standards men (and other women) hold women to. Definitely worth a read! She was no feminist but this book reveals that Margaret Thatcher was much more complex than her public persona would convey. Caroline Slocock’s unique insight challenges us to reassess our first woman Prime Minister and reflect on the misogynistic way women in power and public life are still treated. Margaret Thatcher was no sister to me, but after reading this book I feel I can be a sister to her.